South East China has always been outward-looking. Many of China's mariners and traders have come from this region. Today, it is again a major center for trade. It has also been the source of much migration. The vast majority of overseas Chinese can trace their ancestry to one or more of the three provinces. In any Western country, most people of Chinese descent can trace their roots to Guangdong, and the most common style of Chinese food in the West is Cantonese (Guangdong) food. Nearly all Taiwanese trace their ancestry to Fujian. In Southeast Asia, most Chinese immigrants came from either Fujian or Guangdong. Hainanese are not as numerous, but also form a sizeable proportion of overseas Chinese populations, particularly in Singapore and Malaysia. For an explanation of the term "Special Economic Zone", see List of Chinese provinces and regions. This area of China is linguistically very rich, with many mutually unintelligible Chinese "dialects" spoken. The language with the most speakers is Cantonese, though it is not spoken outside of Guangdong, followed by Southern Min spoken in Southern Fujian and Taiwan. Other languages spoken include various belonging to the Min (Fujian) group, as well as Hakka. As with elsewhere in China, Mandarin is the lingua franca. As Mandarin is the only language taught in all schools, most people are bilingual in Mandarin and their local tongue. As elsewhere in China, there is an extensive rail network. Rail is the main means of inter-city travel for the Chinese themselves, and many visitors travel that way as well. The system now includes fast bullet trains on some routes; unless your budget is very tight, these are the best way to go — fast, clean and comfortable. All the major cities have airports with good domestic connections; some have international connections as well. See the individual city articles for details. The whole coast, and especially Hainan, is well provided with beaches and many areas have facilities for kite surfing, diving or other water-based activities. This is warm tropical water, though, and dangerous species such as sharks and jellyfish are present in some areas; consult a knowledgeable local before swimming anywhere except on busy beaches. Also, check any rented equipment very carefully before doing any inherently dangerous activities such as SCUBA or hang-gliding; government inspections are non-existent or lax and not all vendors are conscientious. Cantonese (Guangdong) and Fujian cuisine are two of the 'eight famous cuisines' in China. Cantonese food is widespread around the world, the basic style of most Chinese restaurants anywhere. Though true Guangdong cuisine, or Yue (粵) as it is known in China, may contain a few surprises, the essence of the style of cooking will be familiar to most visitors. Fujian cuisine (Min 闽) is known for is seafood. One famous dish is "Buddha jumps over a wall", a complex chowder that supposedly smells good enough to make a vegetarian monk forget his vows and hop a fence. Hainan is also known for its seafood. Hainan food tends to be lightly seasoned and not as heavy as other regions. As anywhere in China, beer, wine, brandy and bai jiu (the local white lightning) are very widely available. See China#Alcohol for discussion. Some brands are common in this region that are much less so elsewhere in China. The Filipino company San Miguel  has breweries in Hong Kong and Guangdong, and their beer is popular among expats and travellers in that region. The Singapore-based firm Asia Pacific Breweries  have a brewery on Hainan and their brands of beer, Tiger and Anchor, are common all over the island. Hainan also has a number of locally-brewed pineapple-based beers, odd but worth a try. Humidity is often very high in the summer. From May to November Typhoons are possible. China's relatively new and quite extensive system of fast bullet trains provides connections from this region to the rest of China. One major line runs from Guangzhou all the way to Beijing on a inland route, via Nanning, Wuhan and Zhengzhou. Branches off this line connect to all the main cities of Eastern and Central China. Beyond Beijing, there is a high-speed line into the Northeast. Another line will run along the coast all the way from Hainan to Shanghai, via Shenzhen, Xiamen and Hangzhou, when it is complete. As of early 2013, this line is open from Shanghai to southern Fujian. The link the rest of the way to Shenzhen is due to go into service late in the year. 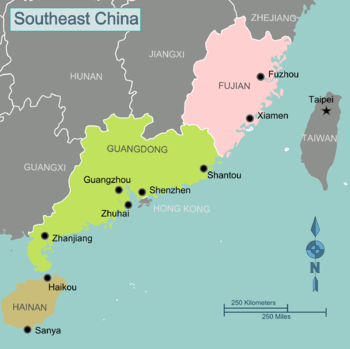 The link further South to Zhanjiang and Hainan is due in 2016. Once those are all in service, they will be the most convenient way to leave the region. There are also good connections by regular train, by road or by air from this region to anywhere in China. See Discount airlines in Asia for flights to Southeast Asia. There are also overland routes to Southeast Asia; the main ones are via Nanning to Hanoi or from Kunming into Northern Laos. This page was last edited on 16 January 2019, at 18:55.